There are 12 Assisted Living Facilities in the Howards Grove area, with 2 in Howards Grove and 10 nearby. The average cost of assisted living in Howards Grove is $4,500 per month. This is higher than the national median of $3,346. Cheaper nearby regions include Sheboygan with an average starting cost of $3,700. To help you with your search, browse the 18 reviews below for assisted living facilities in Howards Grove. On average, consumers rate assisted living in Howards Grove 5.0 out of 5 stars. Caring.com has helped thousands of families find high-quality senior care. To speak with one of our Family Advisors about assisted living options and costs in Howards Grove, call (855) 863-8283. Promotion ends in 71 days! Application is waived for ALL Applications! That's $500 off! Centrally located between Green Bay and Milwaukee, the Village of Howards Grove, Wisconsin is a wonderful option for seniors looking to settle in a quiet, rural environment with all the activities and amenities of the City of Sheboygan just minutes away. Roughly 11 percent of the village's 3,300 residents are over the age of 65. There are two options for assisted living within the village and an additional 28 communities in nearby municipalities, including Shebogyan, Plymouth and Manitowoc. All assisted living facilities located within the state of Wisconsin are required to be licensed, registered and certified by the Department of Health Services. Out of a score of 100, the combined rate of violent and property crime in Howards Grove is only 26, compared to a national average of 34.6, meaning seniors can go about their daily lives with peace of mind. Howards Grove does not have a dedicated public transportation service, so seniors without access to a personal vehicle may find it difficult to complete daily errands or access facilities that are not within walking distance. With low housing and grocery rates, Howards Grove is an affordable option for seniors. Based on the average U.S. rating of 100, Howards Grove receives a 93.2, which is also lower than the state average of 98. Winters are cold in Howards Grove, which can be challenging for seniors. Temperatures can drop to lows of 14 degrees, and an average of 45 inches of snow can be expected each year. Summers, however, are far more temperate, with highs around 86 degrees. Howards Grove has an array of community resources for seniors, including a program hosted by the Sheboygan County Division of Aging that offers weekly meals and organized activities. Howards Grove has few facilities from which to choose in the event of a medical emergency or illness, with the nearest major hospital located in Sheboygan. Assisted Living costs in Howards Grove start around $4,500 per month on average, while the nationwide average cost of assisted living is $4,000 per month, according to the latest figures from Genworth’s Cost of Care Survey. It’s important to note that assisted living rates in Howards Grove and the surrounding suburbs can vary widely based on factors such as location, the level of care needed, apartment size and the types of amenities offered at each community. 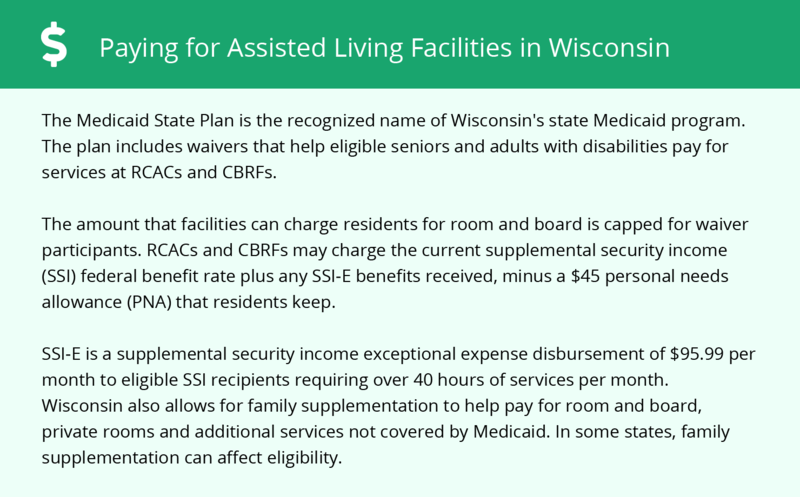 The Medicaid State Plan in Wisconsin does offer some coverage for personal care services; however seniors may need to seek additional financial support to cover their assisted living costs. 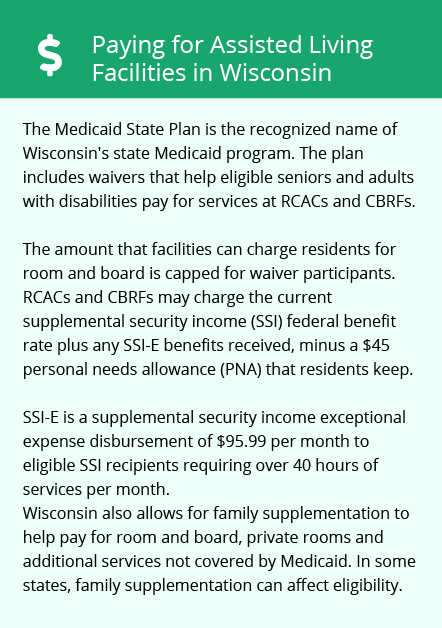 Wisconsin is one of six states that provides non-Medicaid state-funded programs in addition to Medicaid, which can greatly reduce the financial burdens of services associated with residential care settings. Information on programs and financial assistance options available to residents of Howards Grove can be accessed via the Aging & Disability Resource Center of Sheboygan County (ADRC). Howards Grove and the surrounding area are home to numerous government agencies and non-profit organizations offering help for seniors searching for or currently residing in an assisted living community. These organizations can also provide assistance in a number of other eldercare services such as geriatric care management, elder law advice, estate planning, finding home care and health and wellness programs. To see a list of free assisted living resources in Howards Grove, please visit our Assisted Living in Wisconsin page. Howards Grove-area assisted living communities must adhere to the comprehensive set of state laws and regulations that all assisted living communities in Wisconsin are required to follow. Visit our Assisted Living in Wisconsin page for more information about these laws.